Representations of women are often informed by traditional social dichotomies such as saint vs. sinner, nurturer vs. hedonist. Life is more complex and nuanced than these simple polarities suggest and many women have qualities that contradict these schemes. 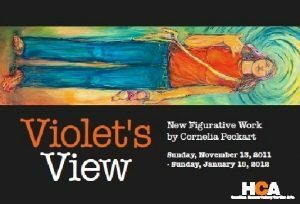 Violet’s View is an exhibition of large-scale portraits that depict confident, assured women who are strong and tenacious. It goes beyond conventional gender caricatures and shows the striking diversity of women.